look at the stats for the United States population now and by 2025.
and then check out the other countries. See ALL the Countries end of this page. Why'd they just shut down the EMP Commission? "If a North Korean EMP could kill 90% of Americans in a year, why did they just defund the Congressional EMP Commission?" 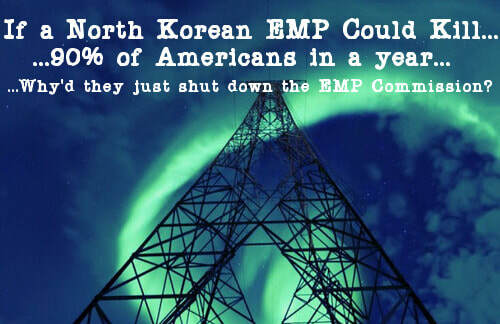 As we reported on ANP back on October 12th, despite pleas from EMP experts such as Dr. William R. Graham and Dr. Peter Vincent Pry, the intelligence has fallen upon deaf ears and as this story over at The Hill reported, North Korea won the battle against America's EMP Commission. Sadly, losing that battle could result in 90% of Americans dead within the year following such an attack and as was asked by Dr. Pry in this ANP story back on October 10th, will America's epitaph be 'died of stupidity'? Yet we need to remember that it WASN'T North Korea that killed the EMP Commission but those within America. And because of that, maybe we shouldn't be surprised that the EMP Commission has been disbanded as their warnings have gone unheeded for nearly 17 years, leaving America's biggest 'achilles heal' totally un-addressed. Despite more and more evidence that North Korea has the capability to launch such an attack upon America, we're reminded that all they'd need was one successful attack to send America quite literally back to the dark ages. You can see the statement given by Dr. Pry and Dr. Graham to Congress in the Scribd document that we've embedded below videos. With America now suffering through one disaster to the next with droughts and fires, massive weather modification taking place across the country, what appears to be an orchestrated psy-op going on in Las Vegas with nothing making any sense with the coroners office there on lockdown and earth changes from the east coast to the west. We take a look within this story at why the website Deagel.com's forecast for 2025 America likely gives us a very accurate view of what future America will look like. With depopulation events now happening across the nation, many more are likely on the way if the globalists goals are to be met. Why would the EMP Commission suddenly be disbanded at a time when America may be under the greatest threat that we've ever been of an EMP attack with these same experts recently warning that 90% of Americans could die after such an attack upon us? If there really are 'enemies of America within' who want Americans dead in huge numbers such as those shown over at Deagel.com, there'd be no better way than an EMP attack upon us. Likely called either 'fake news' or a 'conspiracy theory' by the mainstream media and the general US population, the website Deagel.com is still forecasting an 85% drop in the population of America between now and 2025. With 324 million people living in the US in 2016, their bizarre forecast of only 54 million people living here in 2025 defies explanation. While the population density drop of 34 inhabitants per square mile in 2016 to only 6 inhabitants per square mile in 2025 as seen in the screenshot from Deagel above might delight those who find it difficult to live among huge crowds of people, they also put further emphasis upon what America might look like within only 7 years. The huge drops in both gross domestic product and GDP per capita show an America as a 3rd world nation, or an America sent back to the dark ages via an EMP attack that brings down our grid and is just beginning to truly rebuild our infrastructure. These numbers seen below also show an America whose military has been 'neutered' with a drop from $612 billion in military expenditures in 2016 to a forecast of only $8 billion spent upon the military in 2025. What does Deagel know that we don't know? With purchase power parity forecast to drop from $57,300 in 2016 to only $11,304 in 2025, they see an America in 2025 looking almost as bad as Venezuela in 2016, which had a PPP of $15,100. Do these numbers show 'the fall' of America? It's long been warned that for the globalists to complete their imposition of a global, totalitarian dictatorship, the strongest country must fall...and that is America. Do Deagel's numbers suggest an apocalyptic event for America? While the msm hasn't even touched upon Deagel, at least they themselves attempted to answer many of the alternative media's questions in their explanation of why they feel America is about to hit rock bottom. The majority of the economic and demographic data used in the making of the forecasts is widely available by institutions such as the CIA, IMF, UN, USG, etc. You can see the most relevant data at every single country's page. There is a tiny part of data coming from a variety of shadow sources such as Internet gurus, unsigned reports and others. But all these sources are from the internet and are of public domain for at least a minority. By the way, no pandemic or nuclear war is included in the forecast. The key element to understand the process that the USA will enter in the upcoming decade is migration. In the past, specially in the 20th century, the key factor that allowed the USA to rise to its colossus status was immigration with the benefits of a demographic expansion supporting the credit expansion and the brain drain from the rest of the world benefiting the States. The collapse of the Western financial system will wipe out the standard of living of its population while ending ponzi schemes such as the stock exchange and the pension funds. The population will be hit so badly by a full array of bubbles and ponzi schemes that the migration engine will start to work in reverse accelerating itself due to ripple effects thus leading to the demise of the States. This unseen situation for the States will develop itself in a cascadepattern with unprecedented and devastating effects for the economy. Jobs offshoring will surely end with many American Corporations relocating overseas thus becoming foreign Corporations!!!! We see a significant part of the American population migrating to Latin America and Asia while migration to Europe - suffering a similar illness - won't be relevant. Nevertheless the death toll will be horrible. Take into account that the Soviet Union's population was poorer than the Americans nowadays or even then. The ex-Soviets suffered during the following struggle in the 1990s with a significant death toll and the loss of national pride. Might we say "Twice the pride, double the fall"? Nope. The American standard of living is one of the highest, far more than double of the Soviets while having added a services economy that will be gone along with the financial system. When pensioners see their retirement disappear in front of their eyes and there are no servicing jobs you can imagine what is going to happen next. At least younger people can migrate. Never in human history were so many elders among the population. In past centuries people were lucky to get to their 30s or 40s. The American downfall is set to be far worse than the Soviet Union's one. A confluence of crisis with a devastating result. While it looks like massive depopulation for the US within 7 years, we may consider ourselves lucky as we see in the forecast for North Korea, it almost looks like the country will be wiped off the map by 2025. Is this more proof that a nuclear World War 3 is in the works and North Korea will be non-existent within 7 years? We thank Steve Quayle for sending us Deagel's 2025 forecast for North Korea. With nuclear war talk at the highest that we can ever remember, its quite the given that if North Korea launches an EMP attack upon America that takes down the grid nationwide, the response by President Trump and the US would be overwhelming with North Korea absolutely wiped off of the map. But by then, it would be far too late for 90% of Americans. Is the fact that the EMP Commission was shut down and government never did take any concrete steps to address our very real 'achilles heal' proof of a dark and sinister plot to complete the destruction of America? For anybody who thinks that America would still be a 'free nation' after an EMP attack upon us, you're likely gravely wrong. Such an attack would allow government to complete the imposition of their totalitarian control grid with 324+ million Americans living in the dark ages. So completely dependent are we upon electricity to live our daily lives, everything would quickly come grinding to a halt and as many in the alternative media have warned of over and over and over again, an America without electricity for 9 months to a year immediately brings about TEOTWAWKI, the end of the world as we know it. In the first video below we hear that something huge is up with the end of the funding of the EMP Commission despite no progress being met upon hardening our electrical grid over 17 years, a total failure of leadership. Should the US be hit by an EMP over the next several months or years, leading to 270+ million US deaths, blood will not only be on the hands of North Korea or whoever delivers the 'death blow' to America but on the hands of those who failed to secure our grid. In the 2nd video below we get the truth about the apocalyptic wildfires now burning California, fires which some believe have definitely been affected by the weather modification programs that are going on across America. In the 3rd video below we hear in a new video from Infowars that the globalists 'chemical holocaust' against the world is still ongoing while in the final video below, we hear more about the luciferian depopulation agenda and the forecast on Deagel.com. So, what does Deagel know that we don't know? ANP has recently reached out to Deagel for a comment on this story and their 2025 forecast for America but we've yet to hear back from them. If we do, we'll follow up with a brand new story based upon their answers to our questions. During the Cold War, major efforts were undertaken by the Department of Defense to assure that the U.S. national command authority and U.S. strategic forces could survive and operate after an EMP attack. However, no major efforts were then thought necessary to protect critical national infrastructures, relying on nuclear deterrence to protect them. 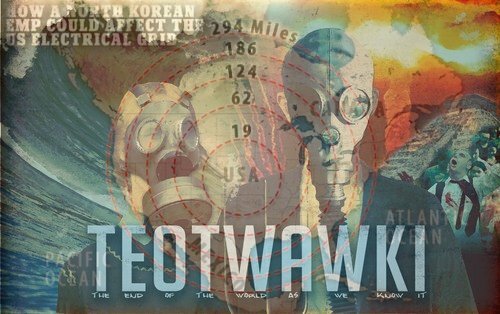 With the development of small nuclear arsenals and long-range missiles by new, radical U.S. adversaries, beginning with North Korea, the threat of a nuclear EMP attack against the U.S. becomes one of the few ways that such a country could inflict devastating damage to the United States. It is critical, therefore, that the U.S. national leadership address the EMP threat as a critical and existential issue, and give a high priority to assuring the leadership is engaged and the necessary steps are taken to protect the country from EMP. By way of background, the Commission to Assess the Threat to the United States from Electromagnetic Pulse (EMP) Attack was established by Congress in 2001 to advise the Congress, the President, Department of Defense and other departments and agencies of the U.S. Government on the nuclear EMP threat to military systems and civilian critical infrastructures. The EMP Commission was re-established in 2015 with its charter broadened to include natural EMP from solar storms, all manmade EMP threats, cyber-attack, sabotage and Combined-Arms Cyber Warfare. The EMP Commission charter gives it access to all relevant classified and unclassified data and the power to levy analysis upon the Department of Defense. Over the weekend, in a dim corner of Washington D.C. and in a quiet recess of the Pentagon, a national security tragedy occurred with little notice or fanfare. ​On Sept. 30, the Congressional Commission to Assess the Threat of Electromagnetic Pulse to the United States of America (or EMP Commission) was shut down indefinitely. Since 2000, the EMP Commission, an unpaid team of leading scientists, engineers, and security experts has worked tirelessly to test, understand, and uncover risks posed to our nation's civil and military infrastructure by Electromagnetic Pulse (EMP). EMP is a well known physical electromagnetic phenomena generated by a nuclear or special weapon or coronial mass ejection (CME). In 2012, Earth passed by a CME that missed the planet by days. Had Earth passed through the phenomena, damages would've set the United States back 200 years, according to NASA. Based on historic data, Lloyds Bank and Oxford University fixed the likelihood of a major CME impact to North America at 12 percent per decade. Over the course of 17 years, the commission's research effectively uncovered key risks to the nation's power grid and civil infrastructure including dangers to nuclear power stations and even federal government. However, while EMP sources and risks remain, the official work to educate our public and leaders has ended. Ironically, on Sept. 20, just days before the commission's termination, the commander of United States Strategic Command warned that America is unprepared to deal with EMP. Describing the effects, General John E. Hyten warned, "It's a dangerous threat and a very realistic threat. If you set off an EMP, a high altitude EMP, basically every light in this hotel is going to go off; every computer is going to go off; every cell phone is going to go off; and every car in the parking lot will no longer work. That's what an EMP does ... We have to be able to respond. But our nation has not looked at EMP." Such damage would affect the continent and take months to years to correct. The security-centric efforts of the EMP Commission have not been unopposed. In fact, the energy industry along with the North American Energy Reliability Commission (NERC) and Federal Energy Reliability Commission (FERC), have sought to maintain a status quo which according to the EMP Commission's in depth analysis leaves 90 percent of American's at risk. By acting as a buffer to industry rather than serving wider public interests, the NERC and FERC have well protected the electric industry while leaving America's citizens in danger. It's that simple. On Sept. 3, the Peoples Republic of North Korea, as reported by WSJ, sent the United States a clear message that they are willing to use a high-altitude EMP to devastate America. Was this a hollow threat? Perhaps, but few defense experts are also dismissive of Chinese and Russian doctrine which also calls for use of an EMP as a first strike on the United States. Had congressionally mandated funding been provided as promised under the 2016 National Defense Authorization Act, the EMP Commission would've continued its distinguished service. While some may celebrate the disappearance of a government program, the commission is warranted by today's geopolitical and technological challenges. The EMP Commission's work is anything but finished. The prospect of life in modern society without electricity is daunting. Such difficulties have been well highlighted during an hurricane season that has left areas of Texas, Florida, and the U.S. islands in prolonged blackout. Such begs the question, given the dangers, why was funding stripped from Congresses' best technical advisers? Has the threat diminished? Have we acted on the commission's recommendations? Have we acted on the Government Accountability Office's recommendations calling for whole of government to prepare for EMP contingencies? The answer to each is to the contrary. The primary duty of a nation's government is to ensure the survival of the state and citizens. Without an EMP advisory group supporting our increasingly distracted leaders, our vulnerabilities will grow, and in time, be exploited. While we should hope for the best, our survival and security should not be left to the whims of madmen and chance. Thus, good strategy requires we plan for the worst or, as Lloyds warns, an "almost inevitable" eventuality. Congress should take all necessary actions to reduce this threat and reinstate the original commission. It's right for the economy, its' right for our security, and it's right for our citizens. No such national vulnerability has ever offered an enemy so much for so little. We must move to protect America's power grid from EMP now. Life in every corner of America depends on electricity. What would you do without it? and is veteran combat pilot. ​It appears to be a Department of Defense military forecasting and information site. There are 209 countries listed below.